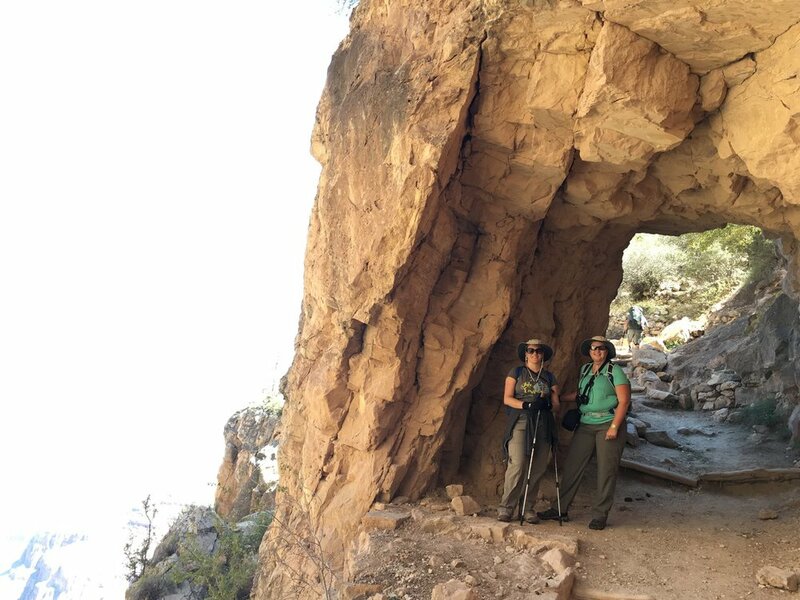 My hiking journey began taking shape in 2016 when I planned a trip to the Grand Canyon with my best friend who lives in Arizona. It was my turn to visit her and we decided we would take our time and truly explore that states beautiful places in the best way, on foot. I had always been interested in hiking, I’d read lots of stories of others adventures, but I was too timid to go alone. In all honesty, it wasn't just being on a trail that made me nervous. I didn't feel like I "belonged" to the outdoor community. I'm not a very athletic person. I'm a little older and a little more fluffy than those cool chicks with the gorgeous Insta photos. But I wanted to truly experience Arizona, so I did some training, flew out west and explored that beautiful state, and fell in love with hiking. Upon returning home, I wanted to keep exploring, but I needed a little motivation and accountability. I struggle with depression, and needed a purpose to help get me off the couch and out of the house. I happened on a 100 mile AT challenge for the National Park Service 100 year anniversary. At the time I found that challenge I had 70 miles on my hiking shoes, so I set a goal to complete those last 30 miles (note: only 1 mile had to actually be on the Appalachian Trail). As the end of 2016 drew near I kept making plans to get to the AT for that 1 mile… but I let my fear and anxiety and my feelings of “not belonging” hold me back from finding that 1 mile stretch. I did complete the 100 miles, but I felt I had failed at my goal. 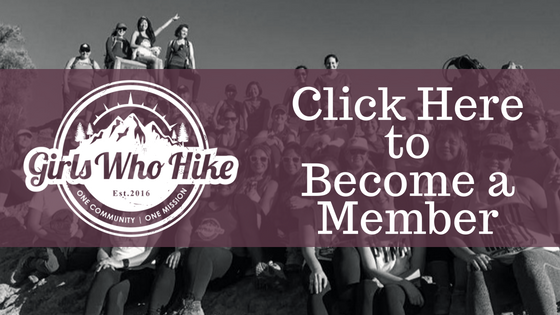 On Jan 1, 2017 I joined the 52 Hike Challenge, which required that I hike at least once a week. I started out strong, and had regular hiking buddies to go with, until life happened and they could no longer make our weekly hiking date. So I started solo hiking. It was then, as I ventured out alone, that I had to come to terms with some issues. People on the trails didn’t look like me so much, or maybe some did and I only saw what I wanted to see. When I was with my friends I was in a no-judgement zone, but alone I became more and more aware of my own insecurities. I'd go out to get my miles in and see others breezing by while I was huffing and puffing and red-faced. I was extremely self-conscious. What did they think as they passed me? Could they hear me sucking wind? How did they cruise on, some even running, while I relied on my trekking poles to get me up and down moderate inclines? In an effort to make myself feel better, I looked for cutesy hiking clothes, but this failed as I’d have trouble finding things that fit me properly. Do they make cute outdoor/workout clothes over a size 14? I remember getting so frustrated at trying on hiking pants, to the point of tears. Was everything made for stick figure women with perfectly muscled athletic legs? Why must every top cling and get bunched up in my muffin top? 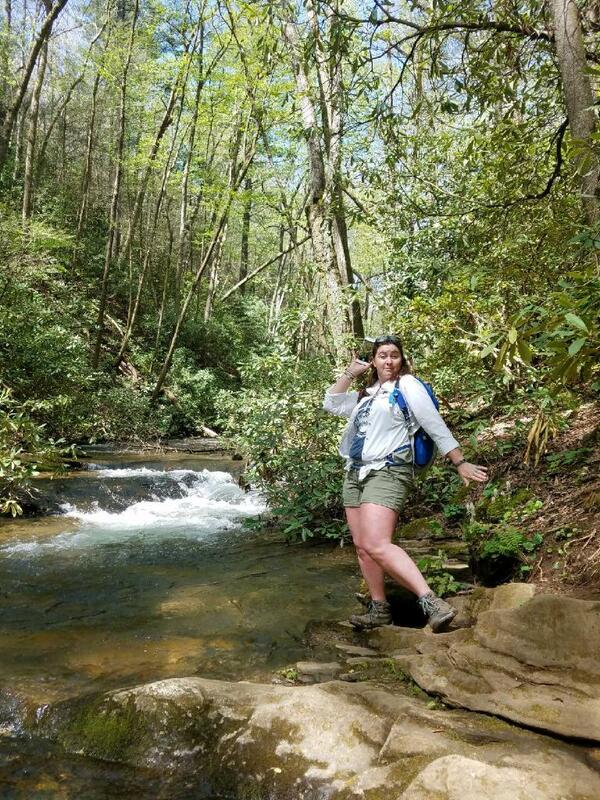 Where is the love for the curvy girl in outdoor/athletic apparel? This further fueled my self-consciousness. Let’s not even think about taking a selfie to post as per the challenge rules. Who wants to see my red nose, or my messy hair. Being insecure about my physical appearance made that requirement tough. I don’t really like pictures of myself. Let's just take a nice landscape photo, or get just a glimpse of the side of my face, just so people will know I did this. Frustrated, feeling frumpy, this was my mindset. 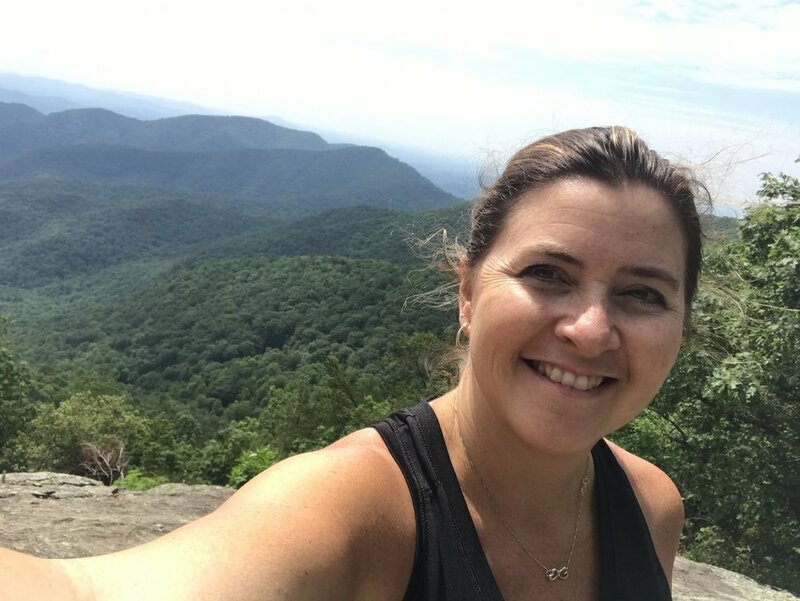 As I progressed with my hiking, making solid headway on my goal of 52, I had a bucket list item to hike some miles on the Appalachian Trail. I was still too timid to go alone, so a sweet friend who'd had experience on the AT met me and we hiked to a beautiful overlook in Georgia called Preachers Rock. I remember that day vividly. As I saw that first white blaze and took those first steps something settled in my soul. It felt like coming home. I’d watched vlogs, read articles and books about the AT. Since my previous year challenge had failed, I had become truly obsessed with the Appalachian Trail. I’m pretty sure I started smiling about the time I saw the road sign noting the trail crossing. My friend knew how excited I was, and made me stop for a photo as we started out and again as we got to the top of the mountain. It might've only been a mile from Woody Gap to Preachers Rock, but that mile changed me. I was so proud of myself for checking that box on my bucket list. I looked out over the amazing view of the southern Appalachians and felt a peace settle in my soul. In that moment, I was right where I needed to be, and it didn't matter what I looked like, or how long it took me to get there, or what anyone else thought. For some odd reason that particular hike made me realize that I am a hiker. I look at those photos he took, and I see pure joy in my eyes. My smile is genuine. My pride in myself is written on my face. Hiking has probably been the single most effective method of changing the way I view my body. Yes, I'm still fluffy. But these legs are strong and have carried me many miles, sometimes with a 30lb backpack. I might have to stop and catch my breath more often than others, but I can enjoy the wildflowers, or the vista while I take my moment. Yes, I still struggle with photos of myself, but I choose to look at it as my hair is crazy because I'm active and sweating. My face is flushed with effort, because I am working hard. I remind myself that it doesn't matter how fast or slow I hike, because that mountain top or waterfall is going to be there, and I will soak in the beauty that I dared to explore, and let it restore me. But most of all, I will be proud of myself, for getting out of my comfort zone, for challenging myself, and for accomplishing my goals. I was successful on my 2017 Challenge, and I’m currently making my way through the 2018 Challenge. This time it’s easier though, because I know that I am capable. I have new friends that I’ve made through Girls Who Hike, and my Georgia ladies are always up for an adventure. Now my focus is on where to go next, rather than what people will think of me when I get there. Amy is the Ambassador for our Georgia chapter. You can join her local meetups and discussions through the Georgia chapter by clicking here.